For those born January 9, 1958. You're one of the first people who's never lived in a world without The Cat in the Hat. In November 2015, Julie Beck wrote about the science and research behind Dr. Seuss's silly words. Around the time you were born, the first successful American satellite, Explorer I, was launched into orbit. In June 2012, Megan Garber wrote about how humans imagined aliens at the beginning of the Space Age. You were born in January of 1958. This year, The Atlantic celebrates its 160th birthday, making it 3 times as old as you. The year you were born, Frederic M. Bennett wrote about the history of antagonism between Muslim and Hindu communities. At 11 years old, you were alive to behold people walking on the moon. The Last Picture Show was released in 1971. Around your 18th birthday, Concorde, the supersonic aircraft, was launched from London. In July 2015, Dara Bramson wrote about the problem with supersonic airplanes. In 1984, Madonna, who was born the same year as you, released the album Like a Virgin. In March 2012, Cathy Alter wrote about what draws women to Madonna. 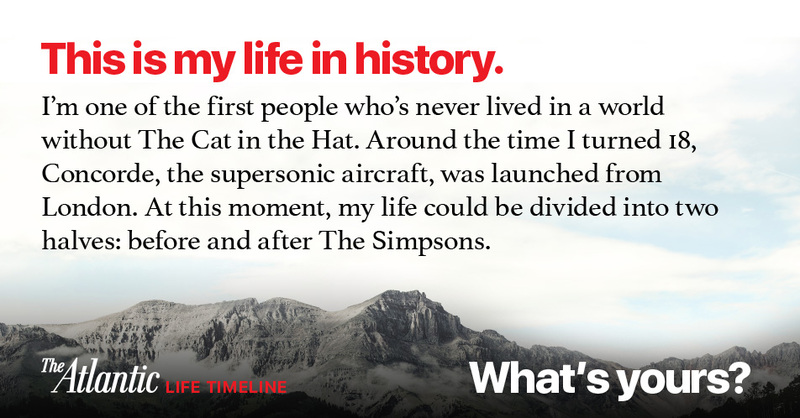 Your life can be divided into two halves: before and after The Simpsons. In February 2012, Hampton Stevens wrote about what The Simpsons had left to say after airing its 500th episode. When you turned 49, you watched humankind reach the outer solar system. By the time you turn 67, the World Bank predicts that the U.S. dollar will lose its global dominance.